Floating on crystal blue waters. Hiking to views of rust- and ocher-hued rock formations. Trekking through magical canyons. Rafting past silent cliffs. Page is the center of Arizona’s canyon country, a launching point for family adventures from Lake Powell and the Colorado River, to Glen Canyon National Recreation Area and the Navajo Nation. But where do you start? Here’s a three-day itinerary with Page as your base camp, guaranteed to satisfy even the hardest to entertain family member, and to get the most out of a long weekend with loved ones. Get your bearings at the Powell Museum & Visitors Center to learn about the natural and cultural history of the surrounding Colorado Plateau. Also, discover how the City of Page sprang up during the construction of Glen Canyon Dam on the Colorado River. Besides exhibits, the museum has a shop where you can snap up local photography and art prints, educational toys for the kiddos and books about the region. 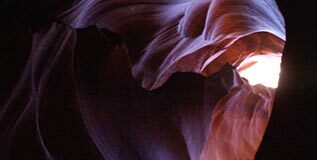 You can also book tours at the museum and visitors center, such as a trek to Antelope Canyon, a magnificent slot canyon with vermillion- and tangerine-colored walls sculpted into curving, striated forms by water and wind. Since the canyon is on Navajo Nation land, you’ll need to book a tour with a guide to walk through the narrow openings, where shifting beams of light provide many Instagramable moments. Make sure you book early, as tours fill up fast. After the hour and 15-minute canyon tour (make sure to arrive 30 minutes prior to your tour), head to the Horseshoe Bend viewpoint, where the waters curve around in a distinctive horseshoe shape. It’s another Instagram-worthy landmark visible from the cliffs high above the Colorado River. Located just two miles south of downtown, it’s a short drive and a moderate, kid-friendly, 1.5-mile round-trip walk to the viewpoint and back. Don’t forget your water bottle! Another must-see for your introduction to the area is the Glen Canyon Dam and its Carl Hayden Visitor Center. Here you’ll learn how Lake Powell, the second-largest manmade lake in the United States, was formed. You can see the dam, river, and lake from designated viewpoints, stop in the bookstore, or take a guided tour of the dam itself. At the end of the day, head out to Lake Powell for a relaxing boat cruise that explores the lake’s deep blue waters and glides along its crenulated lakeshore. 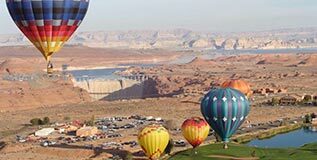 Lake Powell Resorts & Marinas has a menu of cruises. If the troops are restless, try a 90-minute boat tour that takes you past the dam into a narrow, water-filled canyon and by sandstone escarpments. Alternatively, try the two-hour dinner cruise, which combines scenery, food, and adult beverages for mom and dad. You’ve gotten your feet wet, now let’s dive a little deeper. Those thrilling whitewater rafting trips down the mighty Colorado River might be on everyone’s bucket list…or not. For a calmer, gentler way to experience the river, try a half-day, motorized smooth-water rafting trip with Colorado River Discovery. Listen to river tales as you glide down the winding river past sandy beaches and cliffs streaked with desert minerals. You’ll go all the way down to Horseshoe Bend (be sure to look up; you’ll see people at the viewpoint waving), ending at Lee’s Ferry. Be on the lookout for American Indian petroglyphs, wildlife and, in the spring, wildflowers. Back on land, stretch everyone’s legs with an easy hike on Page’s Rim Trail, a 10-mile, mostly flat loop atop a mesa. You can pick up the trail at various points, getting killer views of the dam, Vermillion Cliffs, Navajo Mountain and, on the lake, Antelope Island. As the sun begins to slide behind the cliffs, take the family to Into The Grand, Page’s well-known dinner theater that combines Navajo food with native culture. Try a Navajo taco – a disk of fry bread, topped with, say, beef and pinto beans (there are several options), then take in the live performance, which includes music, dance, and song. Most nights, you can see hoop dancing. On your last day, get into the backcountry around Page and Lake Powell by booking a half-day Jeep tour with Jeep Lake Powell. The private tour starts at your hotel and winds around the lake and up into the nearby Grand Staircase-Escalante National Monument. There’s also plenty of stops to enjoy hiking, views of otherworldly rock formations, and glimpses of the region’s natural and human history. And, yes, the Jeep ride itself offers thrills. On a warm day, a dip will cool everyone’s jets after the rumble and bumps of the Jeep tour. 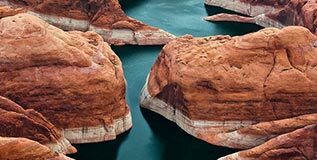 The Chains, a popular swimming spot at the Glen Canyon National Recreation Area, has sandstone ledges that lead into Lake Powell’s refreshing waters. The water is deep here, so make sure everyone in your crew are strong swimmers. Your family’s not alone in enjoying the waters of Lake Powell. It’s also home to bass, crappie, walleye, bluegill and other fish. End your visit with a guided afternoon fishing adventure, so you can take home tasty dinner souvenirs. Choose from several local guide services that offer half-day trips for morning and afternoon. You bring the fishing licenses and the sunscreen, they’ll provide the rest. Thinking about staying longer, or would like to try something else? However much time you have and whatever your interest, make sure to stop by the Powell Museum & Visitors Center for all the info. They’ll make sure you book tours with knowledgeable and accredited outfitters to get your vacation started right. Discover everything Page has to offer and start building your personal itinerary.